No two dogs are alike. As any pet parent can attest, each dog has his or her own personality, likes, and dislikes. One thing is for sure though — all dogs love treats! With so many different flavors, colors, shapes, and ingredients, it can be hard to tell a healthy treat from doggy junk food. If you want to be sure you’re giving your dog a Mother Nature-approved treat for being such a good boy (or girl), try Dogs Love Snapeas Crispy Baked Dog Treats. They’re made from only a few, all-natural ingredients and as the name says, dogs love them! This age-old question still erupts into heated debates. With their sharp teeth and preference for meat, it would be easy to conclude that dogs are primarily carnivores. However, dogs can be observed eating plants and grass of their own choice, which would reflect a natural omnivorous diet. Of course, dogs will almost always choose a steak over a head of cabbage but they naturally know when they need those veggie nutrients that meat just doesn’t provide. What are the best vegetables for dogs? While some vegetables and fruits are very healthy for dogs, others can be toxic and even deadly. Fruits and veggies dogs must avoid include tomato plants, apple seeds, rhubarb, cacao nibs, mushrooms (officially a fungus), currants, apricots, grapes/raisins, onions, garlic, raw or green potatoes, and cherries. Also, there are a variety of houseplants that can be harmful to dogs, so if in doubt be sure to keep all plants out of your pet’s reach. As with most things in life, moderation is the key to good health. A balanced diet that includes nutrient-rich vegetables as well as quality dog food containing lean meats and poultry will help keep your dog healthy for the long run. Dogs Love Snapeas Crispy Baked Dog Treats get dogs begging for veggies! Think it will be difficult to get your dog to eat his (or her) veggies? Dogs Love Snapeas Crispy Baked Dog Treats are the tasty, nutritious way to reward your dog with nature’s goodness. Made from only a few wholesome ingredients, these treats deliver vitamins, fiber and other nutrients with a great taste and crispy texture dogs really do love. 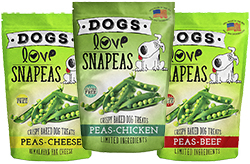 Dogs Love Snapeas Crispy Baked Dog Treats are available in Peas and Chicken, Peas and Beef, or Peas and Cheese flavors. These delectable dog treats are baked to perfection for a light, crispy crunch. 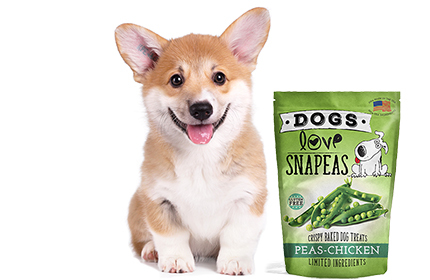 The #1 ingredient in Dogs Love Snapeas Crispy Baked Dog Treats is real peas, which are a very good source of Vitamins B1, B2 and B6, as well as Vitamin C and Vitamin K. They also are a great source of vegetable protein, dietary fiber, iron, potassium and choline. The only other ingredients are sunflower oil, brown rice for an additional fiber source, and either dehydrated chicken, dehydrated beef or Himalayan yak cheese seasoning, depending on the flavor. Reward your best friend with wholesome & healthy Dogs Love Snapeas Crispy Baked Dog Treats, the veggie treat dogs beg for. Win FREE Dogs Love Snapeas Crispy Baked Dog Treats! Would your dog just love some Dogs Love Snapeas Crispy Baked Dog Treats? Just leave a comment below telling us why you and your pet need FREE Dogs Love Snapeas Crispy Baked Dog Treats from 1800PetMeds! Three (3) winners will be chosen at random on Monday, September 11, 2017, so everyone who participates has a chance to win! (Limited to residents of the U.S.) Good luck! Congratulations to the drawing winners: Cindy C, Donna D, and Diane G. Look for an email from us about claiming your prize! My dog Artie loves treats and I want to feed him quality, safe treats so we would both like these. Their are 5 dogs in my house , i would love for them to try something new and different. They love their veggies more than regular dog treats, maybe this is something they would like! My pups are just a couple of cute peas in pod together and I know they would absolutely love these crispy little treats. These treats look great tasting and healthy which for small dogs is a feat since they put on weight so easily. Let us try out these new safe healthy treats and maybe it can become our new “go to” treat! Thanks from Tootsie and Lolly! My dogs need these in their life! Maybe they will stop gaining weight hahah! My dog, King Arthur is the real Cookie Monster. He is always willing to try out new treats. Thanks, dear for sharing an Amazing post I ever read..this post having very useful information .i suggest you all of you guys to must read it. I really enjoyed it a lot and get information from this article. But here I have a very quick question How we can realize our how to keep your dog healthy and live longer ? Hope soon you will write a detailed article to give complete info about my question.